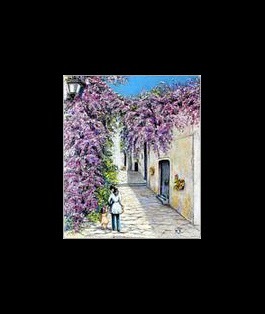 I painted this scene as a celebration of spring, here in Andalucia southern Spain.Much is from my imagination. The glorious old bougainvillea,which has climbed up the ancient building and entwined itself along an unused cable, is in full flower at this time of the year and will remain so for many months This is a typical little street in a small, mountain village in Andalucia, southern Spain. The narrow walkway climbs steadily upwards towards a distant alley. What lies beyond? Where are these figures going and, are they mother and daughter, or sisters? 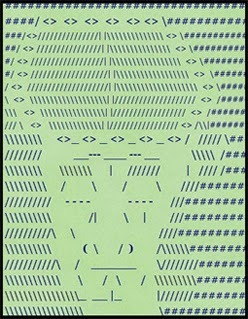 Up to the viewer to decide. I felt drawn to create this painting as a celebration of new life. I am always amazed by the sudden abundance of spring flowers, after we have been blessed with winter rains, in this beautiful Andalucian countryside. 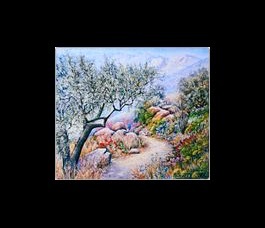 As I painted this at my home, I could see the mountains in the distance and the olive tree to the left, but the path, rocks and flowers, although typical of the region, are imagined. Thank you for including my work in your blog! Bless you.